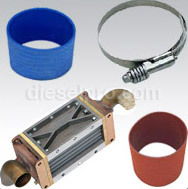 There are dozens of functional components working together inside a diesel engine, and each of these parts serves an important function that promotes peak engine performance. Whether you are concerned about engine performance or you need to make a repair due to a breakdown or another issue, you may be in the market for new Detroit Diesel intercoolers. At Diesel Pro Power, we are the ideal resource you can turn to when you need to find diesel engine parts for any model of engine. We carry an extensive range of products in stock for all of your auto repair and rebuilding needs, and this includes Detroit Diesel intercoolers for all types of engines, like 8V92, 12v71, 8v71, 6-71 and 6V53. In fact, whether you need the entire intercooler or just a gasket or a hose for an intercooler, we have the parts you are looking for. You do not have to waste your valuable time searching through aisles of auto parts at a local store only to find that the part you need is out of stock and must be special ordered. There is a faster and more convenient way for you to get the parts that you need, and you can enjoy the better process when you order your intercoolers and related parts through Diesel Pro Power. We are committed to providing you with an easier shopping experience, and we want to help you with this process today. 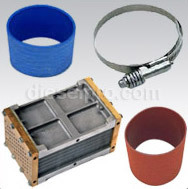 To begin buying your auto parts online through our website, you can browse through a list of Detroit Diesel intercoolers or you can search for the specific engine type or parts number that you are looking for. With several ways to locate the parts you need without having to leave the comfort of your home, you can easily find the parts you are shopping for today. Diesel Pro Power makes it easy to find the parts you need and to have them shipped right to you. You simply take a few minutes of your time right now to order your parts, and you can sit back and relax while your parts are delivered to your location. Once you have experienced the difference when shopping with Diesel Pro Power, you will turn to our website for all future auto parts needs.